This article IS such a lie. You are blaming families and not these overpriced stores and Restaurants who waste food. Wow!! You are so backwards. Stop going to these high class neighborhoods to get your research. I struggle to put food on my table each week. And can't qualify for State assistance to spend on Candy, Chips and Soda. Nor am I a farmer who can build mansion on my land from all of the Government handouts I receive. But can't put in an irrigation system. Then complain about a drought and want insurance payouts on top of the free cash handouts. Give me a break! So that the price of food increases and never goes down for cash strapped households. All these articles are a joke. Please stop posting lies. I think what the study is trying to show is how from farm to table to restaurants to households that there are little bits among the way that lead to this total. I know many others here who struggle to put food on their table. What do you think we can do as a country to help out more if we have such a large amount of wasted food? I don't know. Sounds accurate to me. But when things are cheap that is what happens. I applaud the fact that you don't have wasteful habits, but 2/3 of the article discusses the problems with restaurant portions and overstocking in grocery stores. And the fact that you don't waste food doesn't mean that many others don't – I live in a metropolitan area where many households make exactly the choices described above. They buy too much, or throw it out if they decide to eat out. I'm guilty of this on occasion. Highlighting the problem will encourage all of us to be more thoughtful in how we eat. Please don't insinuate that all farmers live high on the hog on government subsidies. We farm in Virginia and receive no assistance from anyone and grow mainly crops that are uninsurable. We also work with groups like Society of St. Andrews to gleen our fields and take unmarketable yet edible produce to those who are less fortunate. I agree with your comments about candy and pop on food stamps, but don't lump all farmers in with the greedy corporate agri-business like Archer-Daniels etc. I am a farmer. If I want to double my money, I put up a second mailbox! You are an example of someone completely unable to see beyond your own nose and labels as lies facts that don't match your myopic world view. Bob & Bradys – excellent replies. But, your efforts are wasted replying to someone who is so irrational. the only thing that will stop food waste in this country would be a food shortage. If that happens Diabetty will drop those pounds in a hurry. few more years of drought and we might just get there. drought causes small farms to lose money or maybe even go under. you seriously think that drought will fix our problem. how about you ask all the town that have to have restricted water.. what do you think about that timmaahhyy? This was almost the best thing about raising hogs. They eat anything. Rotten tomatoes, chicken bones, coconuts, and freezer burnt meat. Nothing went to waste at our house, and our trash was never stinky. And that is why you got trichinosis and have major brain damage. Along with regular grain and table scraps, they are given a dewormer mix. The quality of home grown pork is amazing and we are looking forward to raising another batch soon. $1350 to $2275 per month in waste for a family of four?!? Considering that most families of four do not even spend that much on all of their food for a month, I doubt the figure is correct. This must contain some estimate of opportunity cost or indirect environmental costs. 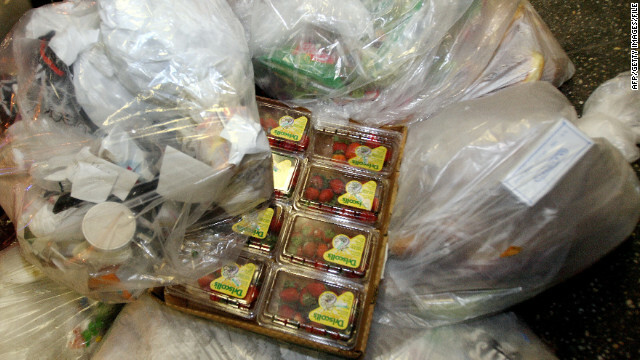 Think about it: $16,200 to $27,300 worht of food is wasted per year by a family of four. In 2006, the real median household income was only a tad above $50,000 per year, before taxes. Also, if each person wasted about 20 pounds of food per month, that would be 80 pounds for a family of four. Unless that entire wastage comprises of lobster or Kobe beef, you would not be able to reach these amounts. Bad journalism on this one. I agree with the issues of unsecured food supplies, water pollution, and general waste, but this type of made-up data does not help any of the causes. CNN, I read your articles all of the time, but get some copy editors. I just read the NRDC report and the waste for a family of four is $1365-$2275 PER YEAR, not per month. Poor editing of an important subject. This makes the article look less legit. Not everyone will read the source material, as is evident by your mistake. Please correct it. Thank you. CNN, please post that you have now fixed the mistake and changed the article, which I notice you have now done. Thanks CLC for seeing the error. We've fixed it. 20 pounds a food a month is still a lot though. Any ideas on what we might be able to do as consumers to further reduce the figure? Mallory, I think we need to redistribute farm subsidies to smaller farms and ask larger farms to diversify crops if they want subsidies. We should also have better food policies that can be enforced. Not necessarily more laws, just different ones. For example, seed lines should not be able to be patented, and this is coming from a capitalist. It was a wrong decision by the courts to say that genetic material can have a patent. I have also seen first hand how public benefits allow for purchasing soda, chips, lobster and other non-essentials. The WIC program in Wisconsin is great, as it limits the types of food to nutritious ones. This reduces cost as well. I would propose that the "food stamp" (it's not called that anymore) program is changed to keep the current benefits with a restriction to being able to purchase only limited items that are staples (100% juice, grains, vegetables, selected meats, etc). It's a big problem and these would only chip away at it. But it is a start. Thank you. It points to a real problem and a real shame, especially considering those starving. It is disgusting to think so much is wasted before it even gets to the consumer's home and then there seems significant need for the consumer to be re-educated on handling and consumption, changing habits up and down the line to address the problem and better utilize the resource. I hope that was meant as sarcasm. If not, I'll gladly vote against your phony idea of what God is. By looking at the many, many million of severely obese people in the USA you wouldn't think that 40% of food is being thrown away. I would bet that the obese do throw away any food. They just go back for 2nds & 3rds, then just 1 more, then finish the food off. Nobody can plan such that they consume 100% of food. It's not possible. Too many variables. That's probably true but I think it is important that we strive for 100%. I would say I always use >95% of what I buy often 100%. Of course the pre-consumer waste is not easy for me deal with. Why do restaurants serve such huge portions, anyway? ALL of them seem to do it. It's completely unnecessary to satisfy most customers, and incredibly wasteful besides. The real problem is ignorance of the extent of this challenge. I wish there was a way to put this write-up on every dinner table of every family in our country with the requirement that it be read before one can eat again. I would like to officially request that anyone who does not eat ALL of the food that they buy be banned from whining about the economy. I know that there are people who are careful with their money and only buy what they will actually eat – I'm one of those people myself – but these numbers show that those responsible people are very much in the minority. Let's drop the rest of you in a famine-stricken region where the food you waste could have gone to good use and THEN let's hear you whine about "the times being hard." I don't like the idea of food being thrown out in restaurants, homes, etc, but what's alternative? You can't keep it around; it goes bad and there's not room for it besides. Businesses HAVE to play it conservative and buy more food than they need, because if they run short or portions fail to satisfy, customers will take their business elsewhere. I'd agree with giving leftover food to the needy, but what happens when someone gets sick and sues? You KNOW it'll happen. As for crops not being harvested, that sounds fishy. Why would farmers spend money to plant crops if they aren't going to get their money back through selling it? I smell the heavy hand of government SUBSIDY. End the subsidy, and the problem goes away. This whole issue is nothing more than the fact that people, from farmers to consumers, plan imperfectly because we are human. Nothing to be done about that. Also, it's GREAT that food is cheap, even if it means waste. WAY better than the alternative. If there is so much food, why is it so expensive. Usually I'm lucky to afford a peanut butter and banana sandwich. I'm an important British aristocrat. Having a castle and servants cost money, ya know. I've actually long wondered whatever happens to all that food in the supermarket that doesn't get bought. Some of it makes its way to dollar stores, some to charitable donations... but certainly not all of it. WHat happens to all that unsold food? File 13... all that can be done.. Most Americans are overweight. They did not get that way throwing away food.